Let us have our ice and eat it to! Just because it is winter, doesn’t mean we can’t have ice cream! Normally, I don’t eat ice cream or cold salads in the winter. I am normally too cold and the though of having anything that would make me colder, doesn’t sit to well. But, since I moved to my new home, I have been “blessed” with an apartment building that has a good heating system. Living on the 5th floor and having all the floors below us heated, makes my house really toasty. So I don’t mind having something cold, now and then. We have FINALLY finished leftovers (including desserts) and I have been itching to make something new. We have company coming over for dinner and I can’t send them home without dessert. I decided to make deep dish chocolate cookies and vanilla ice cream. This dessert kills two birds with one stone. I have been dying to make both of these desserts for the longest time! I am making this recipe in our ice cream maker but you can use this recipe via other ways to make ice cream, as well (The old coffee can, salt and ice method!). In a saucepan, dissolve sugar and heavy cream. 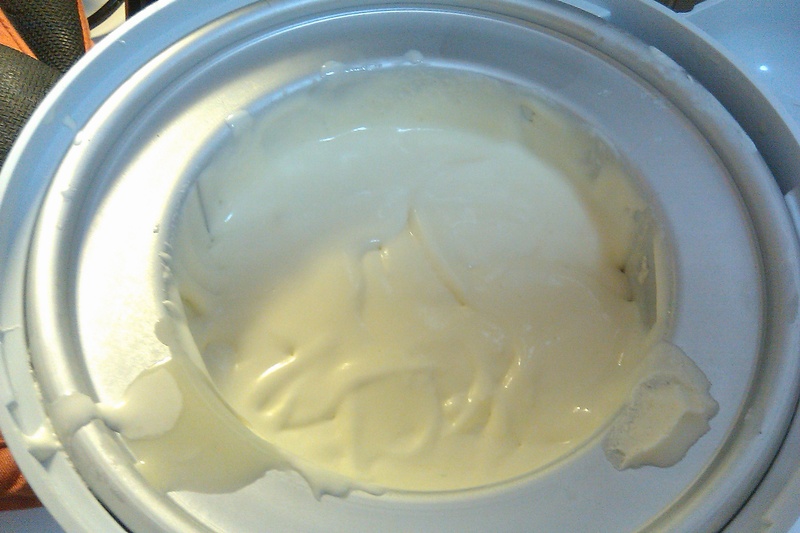 Once you have combined the cream to the eggs, return the ice cream custard to the saucepan. Take the pan off the heat and add vanilla. You may need to freeze this after churning for about 2 hours before serving.